Networking seems complicated if it's not your business focus. Staying on top of evolving network configurations and procedures drains your resources. As an alternative, spend your precious time building your organization by letting IOSi Managed Services handle and optimize the design, implementation, and maintenance of your data & VoIP networks. 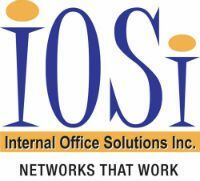 With a proven track record of reliability and seasoned professionals, IOSi remains one of Ottawa's most stable IT providers. When you choose IOSi, you're choosing a regional leader, recognized by customers and the industry alike for reliability, service, and satisfaction.